Last week lessons were cancelled because of that freak spring storm that took out power in parts of Ontario for the better part of the weekend. While it was rainy in Toronto, it was snowy-ice-maggedon out that way. It's amazing how different the weather can be, in Toronto versus an hour drive away. The weather has been unpredictable the last few weeks with hail today and +20 degree centigrade weather earlier this week--it's as if nature can't decide whether to leave winter behind or to move forward into spring. We were fortunate that the weather held out on Friday and we got in with good time. I was scheduled to ride Nifty and ADW was to have a good time with Aspen. I was reluctant because Nifty has a reputation for being a yanker and I didn't feel that my little arms would be able to handle it. Since Nicole and Kent weren't in, Denise suggested I could try Trinket. This is the first lesson I've been on Trinket so I didn't know what to expect but apparently she's one of the more "advanced horses". Sure, I said. Let's try this. Trinket is a small thoroughbred bay mare with white facial markings. She's a sweet horse with good temperament and a curious nature. Everytime I brought a different brush to groom her with, she'd turn over and look at it--as if asking me what I was doing next. I just let her smell it and told her what I was going to do next. She seemed to be content with my explanations. We spent the lesson working on turning with 20m circles, 2-point position and serpentines. The 20m circles were trickier than I thought since the aim was to ride over the center of the poles which were placed radiating from the circle's center as if splitting the circle into 4 equal parts. Let me tell you, this is far trickier than one would think; especially if you're moving faster than a walk. And, Trinket decided to take advantage of me when I lost contact with her mouth and would stop on a dime. Posture is still something I need to work on. The 2-point position was not new for me but ADW had not done them before and this was his first opportunity to try them over the Cavaletti jumps and the ground poles. Again, not an easy feat to accomplish when Trinket would slow down to a walk just as she's approaching the Cavaletti because then I would need to make her go forward and that distracted me. 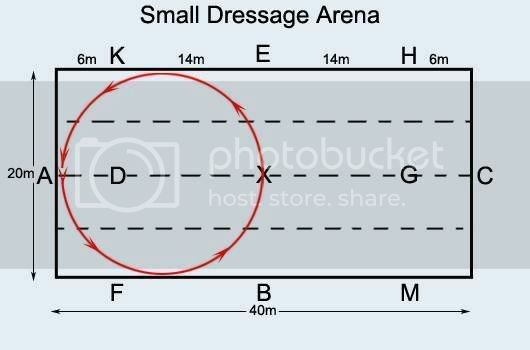 We also did serpentines around the ring and Sheri had to remind us to change our diagonals when we passed through the middle line of the ring (A to C) because we simply forgot! Not that it was difficult to do, but it just wasn't quite second nature yet. At the end of the lesson, ADW said he had thoroughly enjoyed Aspen today because Aspen seemed in good spirits with ADW and responded well--sure beats the last time I got on Aspen... I did reflect some more about my lesson with Trinket since this weekend has me waddling about because of the soreness of my inner thighs. I noticed that she responded poorly to rough handling in the respect of being kicked hard when I wanted her to be forward. She seemed much more responsive when I simply nudged her; and, the whole hand contact was something that was really failing this time. I was flapping about and I'm sure I wasn't providing enough pressure to let her know I meant business. The last thing I noticed was that I tend to pitch forward when I get flustered with trying to keep her going and I'm sure she is NOT impressed with this shift in weight because it means she's got more to lift up when she's moving forward. I know I'd be displeased too. As usual, it's typically rider error and not much horse error... schoolies are all trained properly to respond appropriately but if the message isn't clear or well initiated, it's only expected that the recipient of the message would guess or take advantage of the situation! I'll need to remember to focus on proper posture as it seems to be a failing point for me this time. Aspen was quite the treat on Friday which is surprising after his near death experience during the crazy storm! I'd be nervous too if a tree came through my roof and almost killed me! awww aspen is such a sweetie. everyone loves aspen.